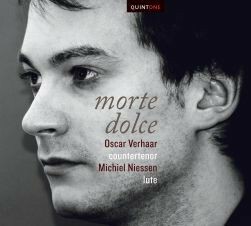 The programme on this CD is built around the Italian songs of Dutchman Constantijn Huygens (1596-1687). Huygens was one of the central figures in the Dutch Golden Age, as he was secretary to the princes of Orange for several decades. Next to his political duties, Huygens was a passionate music lover, especially fond of the voice and the lute. His musical output is, except for a handful of compositions, found in the volume Pathodia sacra et profana (Paris, 1647). The songs in this book are based in the tradition of the solo song, called seconda pratica, developed around 1600 by the work of Giulio Caccini and Claudio Monteverdi, among others. To show how Huygens’ songs relate to genuine Italian compositions, his work is placed next to those of the most revered Italian composers of the time.